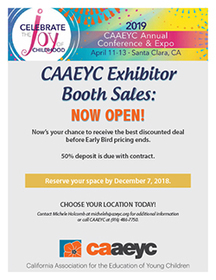 The CAAEYC Annual Conference and Expo is returning to Northern California. We are excited to host this year’s event in Santa Clara, California at the Santa Clara Convention Center located at 5001 Great America Pkwy, Santa Clara, CA 95054. Keep checking the website for details regarding registration, keynote speakers, workshop information, special events and more! Exhibitor opportunities are still available! 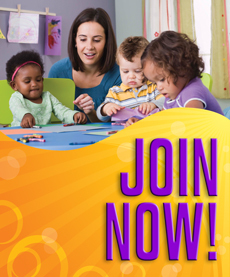 Your investment as an exhibitor provides you the opportunity to connect with customers in the early care and education field. This is a great way to meet face-to-face and learn about their needs. We definitely want you to join us in Pasadena to celebrate your companies as well as the Early Childhood field. Contact Michele Holcomb with available spaces.